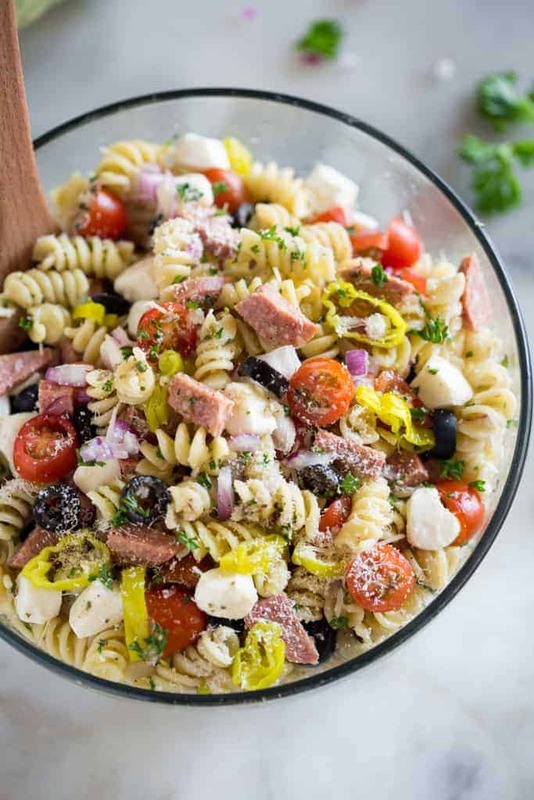 Everyone always loves this cold Italian Pasta Salad recipe made with a simple homemade Italian dressing, rotini noodles, tomatoes, olives, mozzarella, pepperoni or hard salami, onion, and pepperoncini. 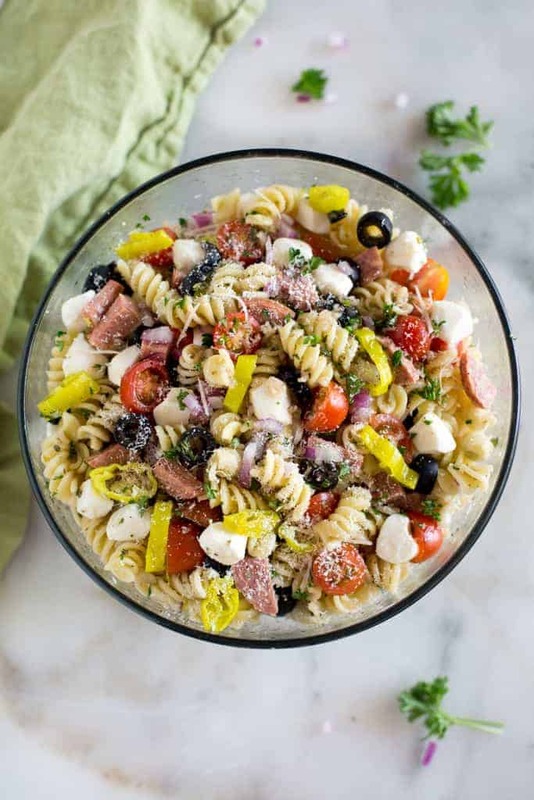 It’s the perfect pasta salad recipe to serve as a side for a BBQ or potluck. 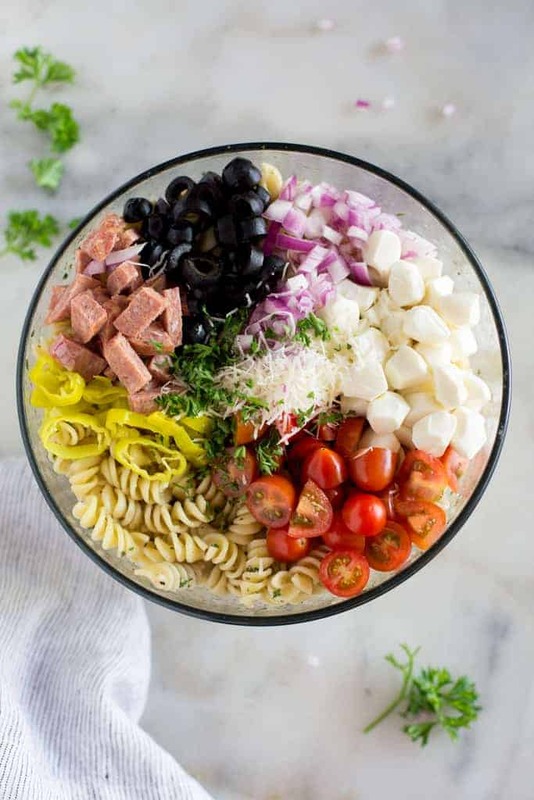 This simple and classic pasta salad is the perfect side to just about any meal, vegetarian side (leave out the salami) or even as a main dish. I love a good cold pasta salad as a side with anything I cook on the grill! Often I serve it with my favorite Black Bean Burger or with these simple marinated chicken tenders. 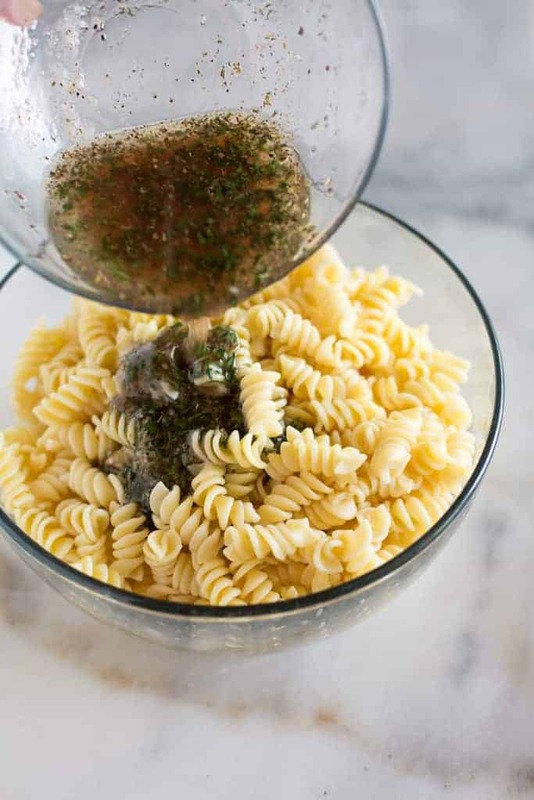 Many people use bottled Italian dressing for their pasta salad but I prefer to make this homemade Italian pasta salad dressing because the flavor is SO MUCH BETTER! It doesn’t have that same artificial tang that the store-bought kinds do, and I always have these simple dressing ingredients on hand. First make the Italian salad dressing by combining the olive oil, red wine vinegar and spices. The salad dressing will last for up to 2 week in the fridge. Next, cook the noodles in a pot of boiling water, according to package instructions. When the noodles are done cooking it’s important to rinse them with cold water, after draining them. Rinsing them with cold water will help cool them off so that they don’t continue to cook, and it will keep them from sticking together. Allow the noodles to cool off before tossing them in some of the dressing. Add the cooked pasta to a bowl, and add the remaining pasta salad ingredients and dressing. Toss everything to combine. Refrigerate for at least an hour. This Italian Pasta Salad is best served cold. A good pasta salad recipe is made by combining ingredients that complement each other well, but pasta salads are also really easy to adapt. If you don’t like salami, add pepperoni or summer sausage, or leave it out entirely to make this a vegetarian pasta salad. You could add other ingredients you may have on hand, like cucumber, bell peppers, chunks of ham, or pine nuts. Everyone always loves this cold pasta salad with homemade Italian dressing. 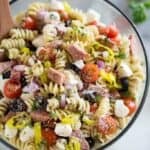 It starts with rotini noodles, tomatoes, olives, mozzarella, pepperoni or hard salami, onion, and pepperoncini tossed together in a delicious homemade Italian dressing, making it the perfect Classic Italian Pasta Salad recipe to serve as a side for a BBQ or potluck. Make the salad dressing by combining all ingredients. Store the dressing in the refrigerator for up to 2 weeks. Shake before using. Cook pasta according to package instructions. Drain water and rinse pasta with cold water. Allow it to cool for at least 10 minutes. Add pasta to a large bowl and pour half of the salad dressing over it. Toss to combine. Add remaining ingredients and dressing and toss everything to combine. Cover and refrigerate for 1 hour or longer, before serving. Store in the fridge for up to 4-5 days. I often use sauteed zucchini instead of cucumber. *I first shared this recipe in May 2016. Updated August 2018. Oh yeah – pinning this, as always!! Hi Lauren, We are going to our grandson first birthday party .And needed a recipe for dressing to put on pasta salad. doesn’t always have the yellow ones on hand. Nonetheless, I improvise with yellow bell peppers. Thanks for all the good recipes which I just discovered on your webpage from Taste Better. I love this recipe! It’s so simple and yummy and my family loves it. I love that it lasts in the fridge for several days and can be made ahead of time for a party. Thanks for sharing! It really is so simple–I’m so happy your family liked it 🙂 Thanks Maria! Terrific! Easy and fun to make. I added pepperoncinis? This may honestly be my favorite pasta salad I’ve ever made. It tuned out sooooooo good! The homemade dressing makes all the difference. May family loved it, so I thank you! ummm.. looking so delicious… pinning this pasta now.. I made this recipe- changed nothing (as I dont believe in leaving a rating if I change it) my bf and I loved it. Excited to make this tomorrow. Why the cucumber comment. Saw no cucumber in the recipe?